Basketball. There’s one person on the court between you and winning the state championship for your team. It’s your last time ever representing your school. Stop, wait, and sweat. Those last few seconds before you decide what way you are going to get around your opponent and score those vital points to get your team the win they have been craving not only as individuals, group of friends or the school, but as an entire community. Pressure is on. There is only one thing stopping you, that is not the pressure of the occasion, your friends screaming out your name or your proud parents cheering on from the sideline but what is stopping you is yourself. These are the moments where characteristics such as self confidence take over far more than what ability can ever do for you. Look once more, GO! The Tall Pique Knit Polo is the perfect fit for a team of basketballers as obviously enough, the main feature of the Polo is what is included in the name “Tall”. It’s classic style is ideal for post match receptions or team events. They are classy, stylish, professional and an ideal smart-casual look. By wearing these polos after big games, it will give these young, upcoming players further inspiration as they look around at each other as a group and see the class of each individual, nut more importantly as a team, when they walk out of the stadium together and into the public eye after a hard fought win. This polo is lighter than other typical styled polos at 5 ounces, and is made from 65% polyester as well as 35% cotton pique. 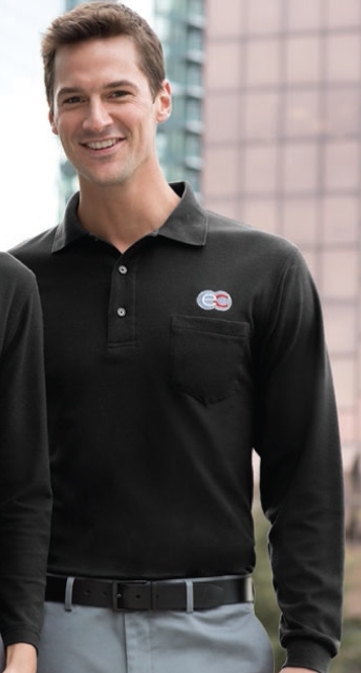 It’s flat knit collar and cuffs keeps the traditional values of a polo shirt. With metal buttons featuring a dyed to match plastic rims, fit nicely with the silk material and it almost gives a modern twist, taking us away from the traditional style and possibly guiding us down to a new, modernized pathway to the future of the polo. Its double-needle armhole seams and hem give it a decent texture, while the side vents will ensure there is no feeling of congestion to the wonderful feeling of silk against your skin. The knit polo includes a 3 button placket, that can gives the wearer three different looks, where they can tie high for a smart look, or leave the buttons open for a more laid- back, casual outlook. Its horn-tone buttons tie in nicely with the classic knit feature, as they are a traditional inclusion to any polo. The locker patch is another traditional inclusion; along with side vents that ensure players of a basketball team not needing to worry about sweating profusely in their polos post game.